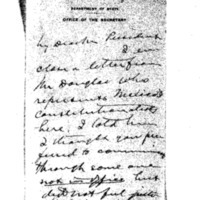 William Jennings Bryan writes to Woodrow Wilson about developments in Mexico. I enclose a letter from Mr. Douglas who represents Mexico’s Constitutionalists here. I told him I thought you preferred to communicate through some one not in office but did not feel justified in disclosing name. I understand that Senor Cabrera will reach Washington tomorrow night — is your agent in touch with him? Mr. Douglas is very much impressed with the high character and purpose of Cabrera. Bryan, William Jennings, 1860-1925, “William Jennings Bryan to Woodrow Wilson,” 1914 January 19, WWP18293, First Year Wilson Papers, Woodrow Wilson Presidential Library & Museum, Staunton, Virginia.